The WHO Medication Safety Challenge fails to emphasize the role of the pharmacist. There’s good reason — health-related and financial — to make this issue the focus of the WHO’s third global patient safety challenge. 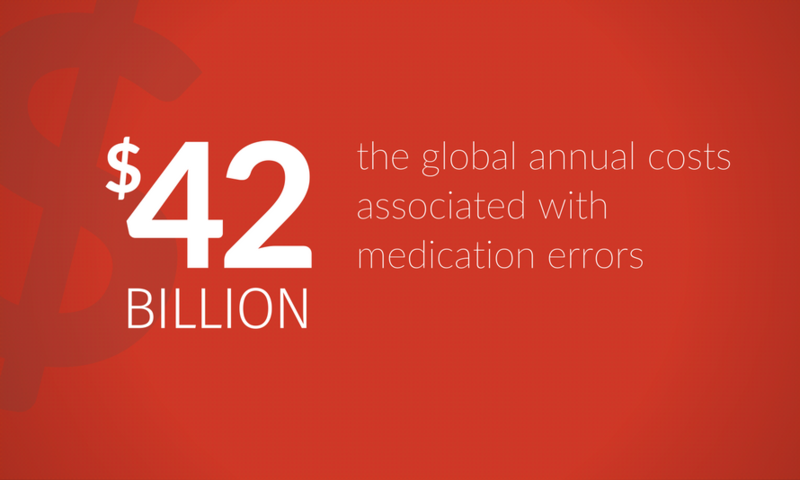 In the United States alone, medication errors cause at least one death every day and injure about 1.3 million people every year.1 The global annual cost associated with medication errors is estimated at $42 billion. Medication accuracy and patient safety are top priorities at Parata. These are driving principles behind our pharmacy technology solutions. So, we were excited to see the WHO shine a light on medication safety. We dove into the plan. The WHO Medication Safety Challenge web page offers resources for health care professionals and the public. We’re looking for information on how the initiative will leverage pharmacists. We find a resource called Topic 11: Improving Medication Safety. Sounds like a good place to start. Five pages in, there’s still no mention of pharmacists. We’re puzzled. But we continue reading. When we reach the end of the resource, we do a quick search. 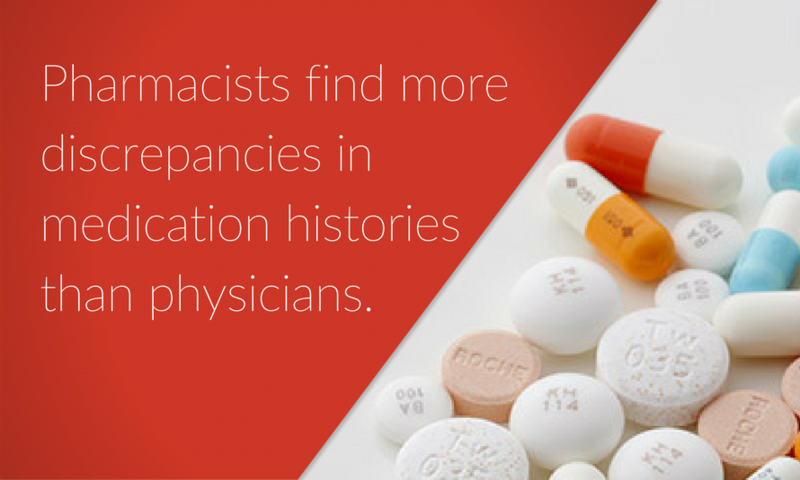 What’s With The Absence Of Pharmacists? For those close to pharmacy, this imbalance points to massive oversight. Where is the rallying cry to include pharmacists — the medication experts — in this effort to improve medication safety? We’re not out to discredit the work of doctors and nurses or question their ability to impact medication safety. We’re also not claiming the WHO is unaware of pharmacists’ value — some of their previous work and words say otherwise. Our point is simply this: You’ve overlooked an essential member of the team. 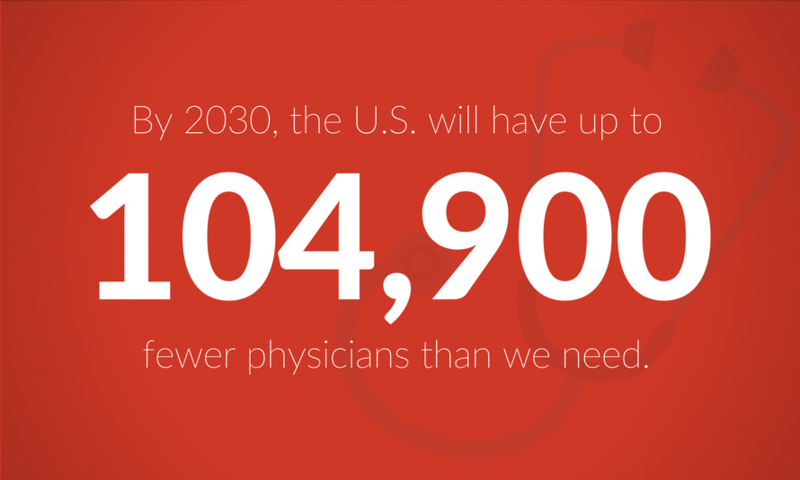 Not Enough Doctors; Not Enough Time. Besides pharmacists being especially well-suited to address medication safety — more on this in a moment — including them in this initiative makes sound sense from a purely logistical standpoint. Prescription drug use increases with age and with chronic illnesses. This growing group is more likely to experience adverse drug events — exactly the challenge the WHO aims to solve. One of the WHO’s recommendations is for physicians or nurses to complete a full medication reconciliation during a patient visit. This advice has also appeared in prominent news outlets, including the New York Times and the Washington Post. Medication Reviews Take More Time Than Doctors Have. While this sounds great in theory, it’s difficult to conduct a thorough medication review during a typical doctor visit. The primary challenge: time. 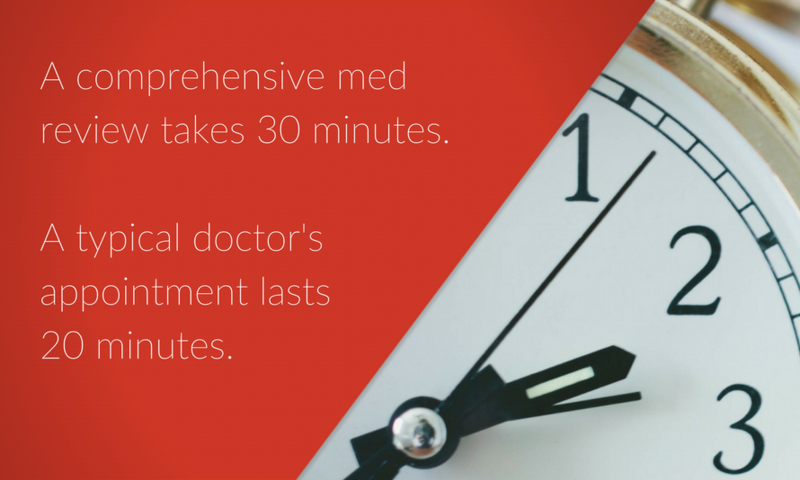 It takes between 30 and 60 minutes to complete a medication reconciliation session or brown bag medication review.7 At its shortest, this is 50 percent more time than patients and physicians have together. Is it reasonable or wise to encourage patients and doctors to use their limited time with patients to gather a medication list? Or are those few minutes better spent having a real conversation about health and wellness — the reason the patient has come to the doctor? There’s A Safer, Smarter Solution. Pharmacists can fill the gap. There’s another member of the health care team who can address medication safety: Pharmacists. Pharmacists have frequent opportunities to engage patients and support better health outcomes. They’re often present for critical and coachable moments, such as after a patient gets a new diagnosis or heads home from the hospital. Here’s why. Everyone is near a community pharmacy. This convenience makes it easy to drop into a pharmacy. There are approximately 275 million patient visits to a pharmacy each week — the equivalent of about 85 percent of the U.S. population.10 There were 922.6 million patient visits to physician offices in the full year of 2013. 11 Patient visits to a pharmacy surpass that number in less than a month. Pharmacists are available without an appointment. Many pharmacies offer extended hours. Patients can walk into a community pharmacy on an evening or weekend and speak to a health care expert. They get almost-immediate access to answers and advice — no appointment needed. This trust — earned through the close relationships pharmacists have built with patients — is tremendously valuable in efforts to influence behavioral change that will improve patient health and outcomes. Pharmacists Are Experts In Medication Therapy. When a physician walks into an exam room to see a patient, his aim is to focus on all possible diagnoses. When a pharmacist approaches a patient, she has the physician’s diagnosis in hand. Based on this diagnosis, pharmacists can help determine the most appropriate medication therapies. Pharmacists focus on therapy, rather than diagnosis. This division of work is a simple explanation for how physicians and pharmacists complement each other. It’s rooted in the curriculum of medical schools and pharmacy schools. Physicians are taught to diagnose; pharmacists are taught to treat. During their four years of school, pharmacy students take courses in biomedical, pharmaceutical, social-administrative, and clinical sciences. They also take a collection of courses dedicated to specific therapeutic areas. This gives pharmacists a deep knowledge of prescription drugs and medication therapies. They are the medication experts. While medical students preparing for a future as a general practitioner or specialist take courses in pharmacology, most don’t review pharmacy at the same level. New prescription drugs are entering the market faster than ever. If the commercials are any indication, there’s a new prescription drug to ask your doctor about every week. That’s not too far off. 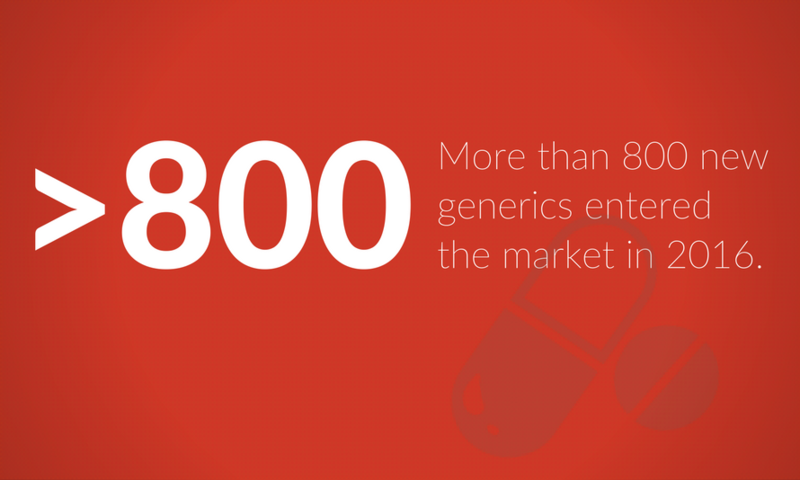 The availability of new drugs and new generics often mean more treatment options and reduced drug costs. But with more than two new drugs coming out each day, it’s almost impossible to keep up with the options available. This is another area where physicians can look to pharmacists for support. Pharmacists maintain an enormous knowledge of prescription drugs and stay informed of new therapies. Want a thorough medication reconciliation? Have a pharmacist do it. A number of studies have compared the results of medication reconciliations conducted by pharmacists, nurses, and physicians. 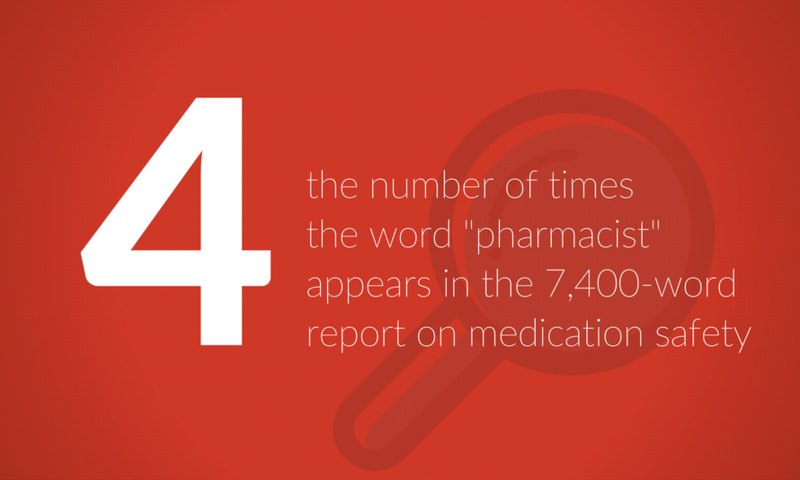 Pharmacists consistently identify more discrepancies and opportunities for intervention. Some of this may be due to time and environment. Much of it has to do with this: pharmacists review medications every day, and their expertise and experience makes them uniquely suited to do thorough medication reviews. Pharmacists also go beyond a medication reconciliation or a brown bag review. In a medication therapy management session or comprehensive medication review — often covered under Medicare Part D — pharmacists incorporate motivational interviewing. This gives them a chance to gauge how well the patient understands their medications and how to take them. With this bigger picture view, pharmacists can further enhance health and wellness. Pharmacists Improve Outcomes And Reduce Costs. Look familiar? Pharmacists are already taking action in these areas. They relate to measures under the CMS Five Star Quality Rating System. 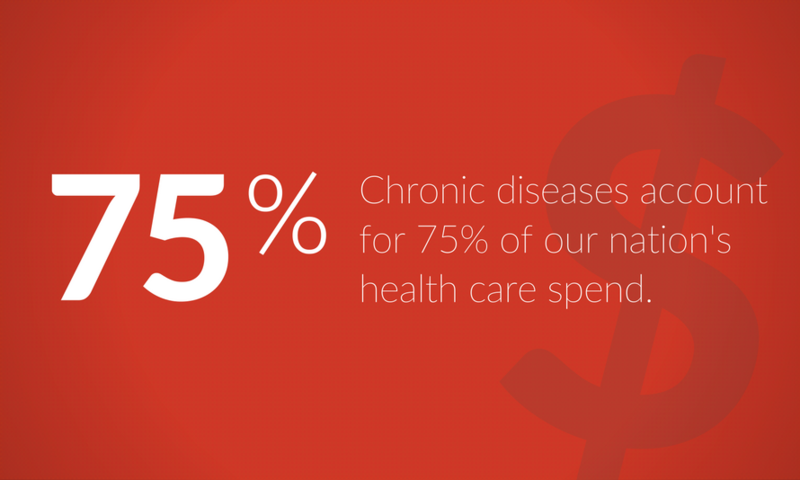 As chronic conditions increase, so does the need for pharmacists. Pharmacists can provide the support these patients need to better manage their conditions. Through tweaks in medication therapies, counseling, and communication between the patient and the care team, pharmacists can help patients lead healthier lives. 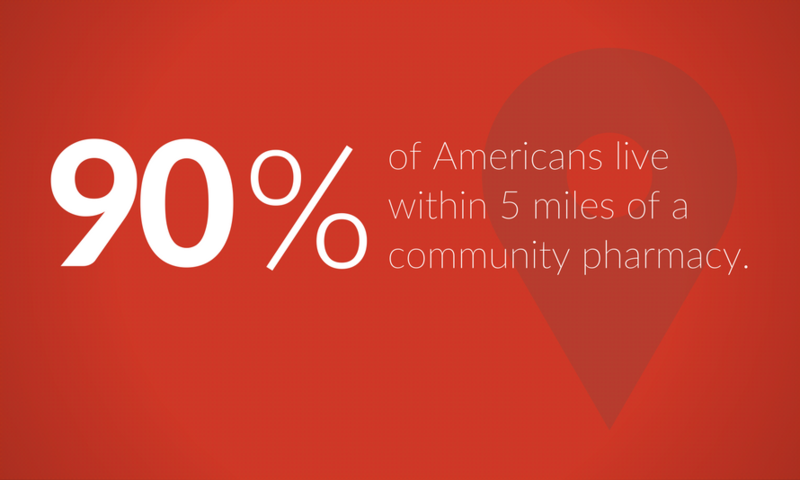 Data Shows Pharmacists Positively Impact Patient Outcomes. What happens when pharmacists have a central role on the patient care team? 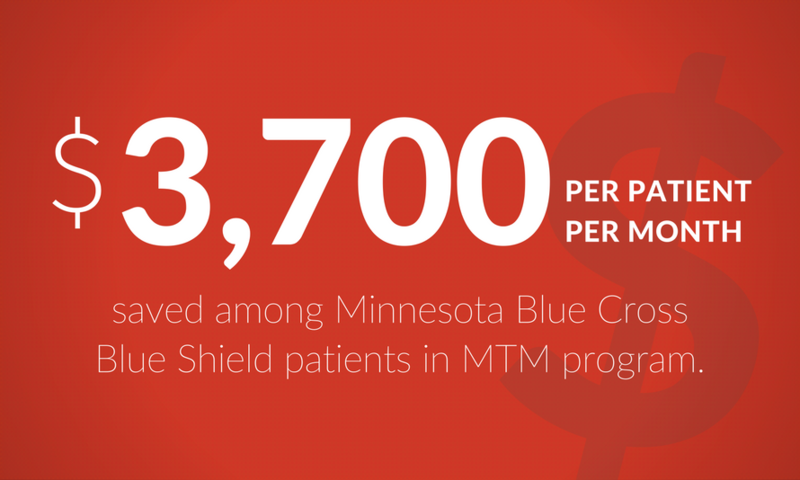 They increase access to care, leading to improved adherence and therapeutic outcomes. When patients stay healthy at home, they cost the system less. 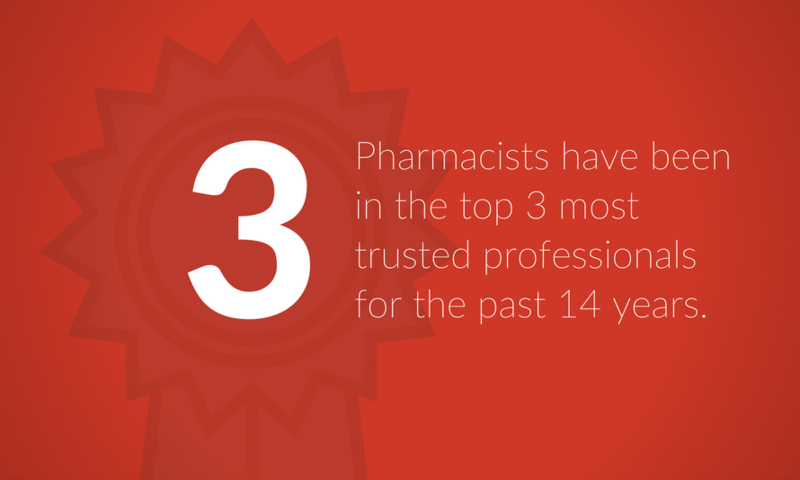 This may be one of the clearest indicators of pharmacists’ impact on patient health. 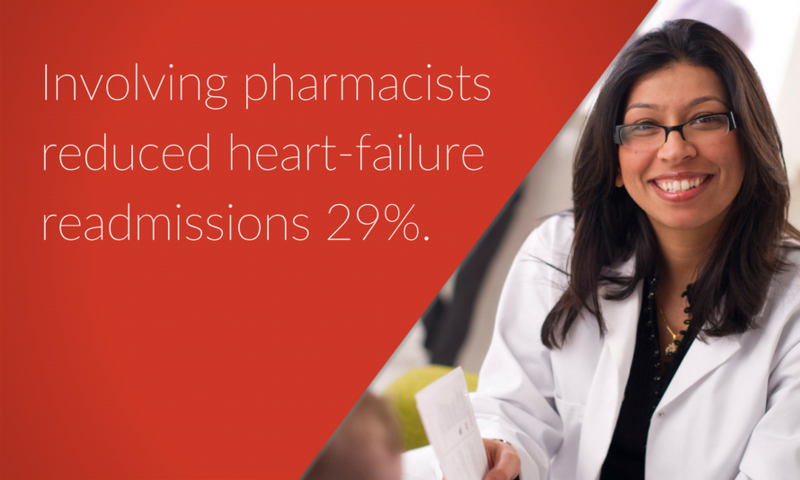 Total costs of care are lower when pharmacists work closely with patients. There’s Still Time To Build The Dream Team. When it comes to building a team to tackle the full spectrum of medication safety, pharmacists are an indispensable player. The American Pharmacists Association advocates for issues ranging from provider status to health IT standards. The National Chain Drug Store Association leads an advocacy program called NACDS RxImpact. It empowers pharmacists, students and faculty, technicians, and patients to take a stand for better health care. The National Community Pharmacists Association provides a voice for community pharmacy and grassroots resources to influence state and federal legislation. The Community Pharmacy Enhanced Services Network connects high-performing community pharmacies. These pharmacies expand patient care services and partner with others on the health care team to improve patient outcomes. 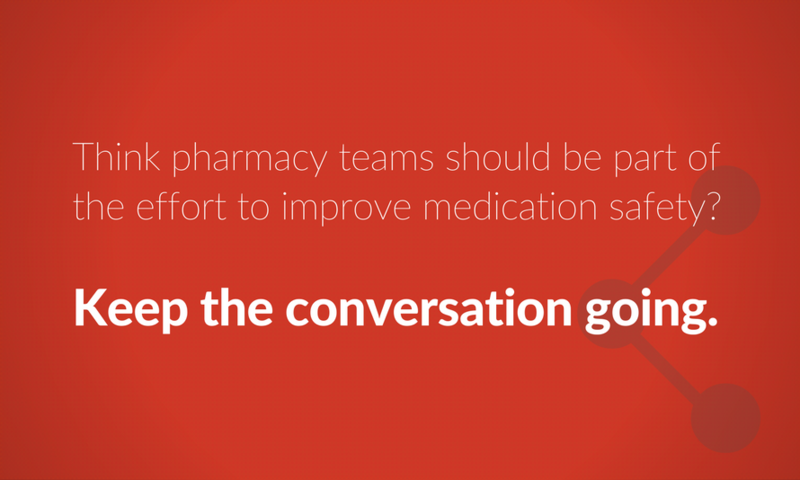 If you believe pharmacy teams should be part of the effort to improve medication safety, we encourage you to share this post. Keep the conversation going. And for anyone at the World Health Organization reading this — if you’re looking for pharmacists who can support your efforts to improve medication safety, let us know. We have a few thousand friends we’d be happy to recommend.